Purchase this product now and earn 3,561 Reward Points! 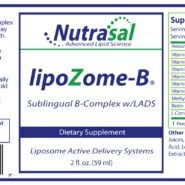 LipoZome B is a Concentrated Sublingual Liposomal B Complex with Methyl Folate, Biotin and L-Carnitine. LipoZome B’s convenient two ounce bottle and sublingual spray delivery allows you take your B’s on the go. Spray multiple times per day for consistent blood levels and sustainable all day energy support. The B complex vitamins are essential to maintaining healthy cardiovascular, nervous, immune, musculoskelatal, and energy systems, among others. Power Up with our high dose, enhanced bioavailable, Liposomal B-Complex.